In model-driven development (MDD), numerous metamodels, models, and model transformations need to be taken into account. These MDD-based artifacts—although highly interdependent—are autonomously maintained. Changes in one artifact (e.g., in a model) are not automatically reflected in other dependent artifacts (e.g., in a model transformation). The barrier for a tight integration of MDD-based artifacts stems from two limitations of current approaches. On the one hand, model transformations are unidirectional and changes can be propagated in one direction only. On the other hand, changes can only be propagated into output artifacts of transformations, not into transformation definitions themselves. In order to overcome these co-evolution problems, our approach is based on establishing bidirectional transformations (BX) between modeling artifacts and on applying higher-order transformations (HOTs) on first-class model representations of transformation specifications. 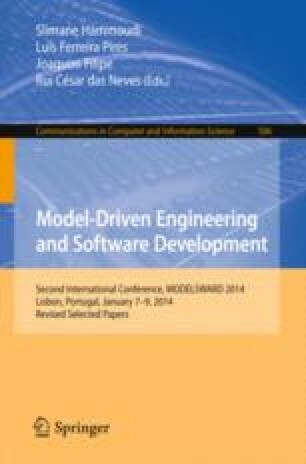 In this paper, we present a generic approach and provide initial prototypes for an integrated tool support which integrates BX into well-established Eclipse-based MDD frameworks, thereby neither being restricted to a specific modeling nor model transformation language. This is an extended version of the paper published as Hoisl et al. . This work has partly been funded by the Austrian Research Promotion Agency (FFG) of the Austrian Federal Ministry for Transport, Innovation and Technology (BMVIT) through the Competence Centers for Excellent Technologies (COMET K1) initiative and the FIT-IT program.